Ahead of their new album dropping early April, Booka Shade offer up the title track, some alternate mixes and another cut as a single, set for release this month via their Blaufield imprint. Their ‘Cut The Strings’ LP is set for release on 4 April and as we edge towards the full project being unveiled the duo shine light on of the leading compositions to be found within the project. This is namely title-track ‘Cut The Strings’, which features Danish vocalist Troels Abrahamsen, the lead singer of electronic rock band VETO, who has collaborated with Kolsch on his 2012 track ‘All That Matters’ and Matthew Dear under his Audion guise for his 2014 Kompakt release ‘Dem Howl’. Across the single Blaufield offers up the original mix of the title track, featuring Booka Shade’s dreamy melodies, dance floor driven drums and bass alongside Abrahamsen’s emotive vocal stylings. 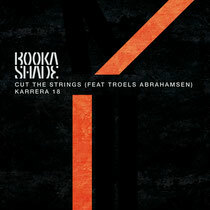 ‘Karrera 18’ then follows, a composition featured only on this single but a reinterpretation of the 2013 release of the same name which has regularly featured in the duo’s live show and sees Booka Shade embrace their darker side, employing dubby stab sequences, bubbling piano licks, hooky vocals and tension building sweeps aimed to create a peak-time workout. The ‘Choir Only Mix’ of ‘Cut The Strings’ follows, shining light on the moody atmospheric choir recordings used in the original composition. It’s out 16 March on Blaufield.